The 1838 Benjamin Rowe Farmhouse located in Gilford Village has recently been listed on the National Register of Historic Places. This exciting and long awaited event became a reality when the National Park Service, a part of the Department of the Interior, awarded the distinction to the Gilford Historic and Heritage Commision and the Town of Gilford on April 30, 2008. The National Register of Historic Places is the nation's official list of cultural resources worthy of preservation. it is part of a national program designed to coordinate and support public and private efforts to identify, evaluate, and protect historical and archaeological resources. The Benjamin Rowe House was accepted for listing on the National Register because of its architectural significance as a Greek Revival cape, and as a rare example of this type of structure executed in brick. 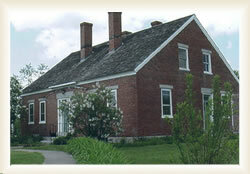 The house is owned by the town of Gilford and is leased by the Thompson-Ames Historical Society. The furnishings of the house came primarily from the Tilton farmstead, another of Gilford's early capes of about the same period. The house is open several times a year, hosts many field trips and may be viewed by appaointment at any time by calling the Historical Society at 527-9009 or speaking to any historical society member. A dedication celebration was hosted by the Gilford District Historic and Heritage Commission, The Town of Gilford and the Thompson-Ames Historical Society.